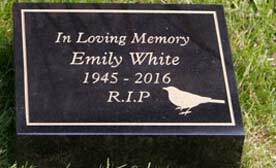 At The Sign Maker we make a large range of stone signs and stone memorials. 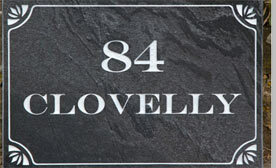 As always we make your stone sign or memorial just the way you want it. 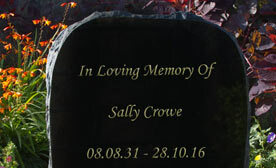 You choose the stone, the size, the font and maybe an image and our designers will create a sign or memorial unique to you. Click on the photos or links below to find more information about each type. 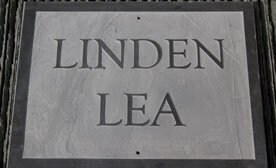 12mm or 20mm thick slate cut to any size you want. 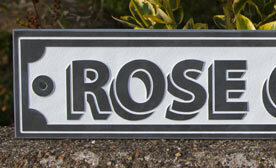 The designer will create a sign unique to you. Can include an image. Excellent value. They are available in the popular sizes. You still choose your font and letter colour. Available with holes or adhesive. 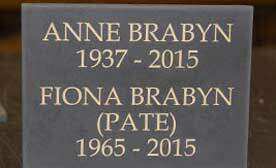 Slate is ideal for stone memorials. 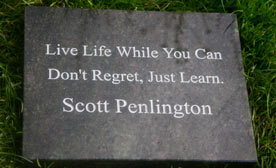 Its cheaper than granite but still very long lasting. 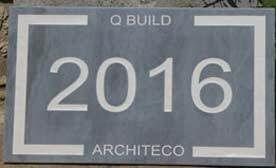 Available in 12, 20, 30, 50, 75mm thick slate. Standard sizes in thicker granite are excellent value for money. 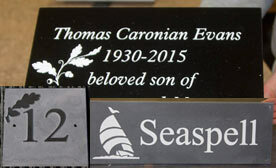 Ideal for both memorials and house name plates. 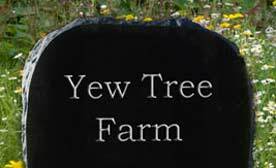 Used for house signs and memorials. 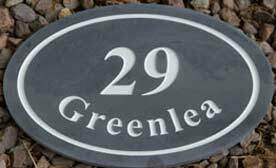 Slate is 12mm thick and available in five round sizes and five ovals. Granite is 20mm thick. 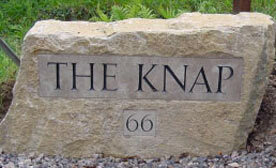 Granite boulders make fantastic entrance signs. They require no maintenance. Available in black or celtic grey. 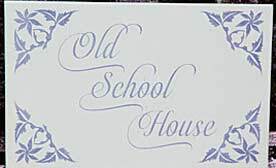 Large choice of fonts. Slate wedges are a cheaper alternative to granite wedges. They are interesting in that the surface is cut through the veins of slate. Granite wedges are made from beautifully polished black or Celtic grey granite. They are available in nine sizes. Purbeck stone is a very durable and hard wearing stone quarried in Dorset. The stone is cut for us to a thickness of 30mm. These are favoured in many situations. 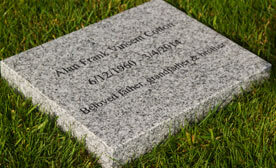 They are used in gardens, crematoriums or even placed on an existing grave. 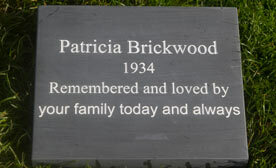 Purbeck stone boulders can be used for memorials or as a stone entrance sign. Only the face is honed smooth for the lettering. 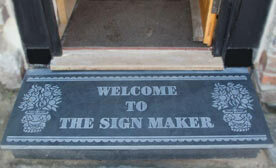 A lovely way to welcome people into your home. 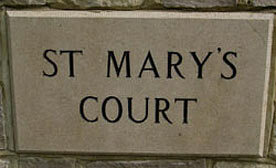 The slate door steps are usually made in 30mm slate with the lettering unpainted. 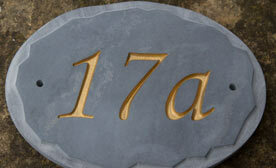 Slate house numbers are very traditional. 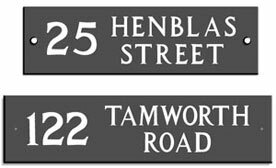 We can make in interesting fonts and letter colours and can add a little image for interest. This is an interesting technique. We blast away the background leaving the lettering proud. The background can be painted. 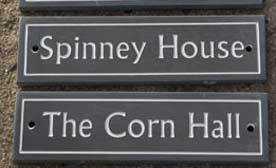 By using a bold font, a shadow effect, raised lettering and a painted background we are able to create these eye-catching slate house signs. 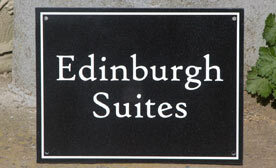 Although only available in one font these slate house signs are excellent value. They can also be ordered very quickly. Lettering is V-cut. No this isn't actually stone, but it looks and feels like stone. 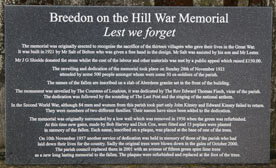 It is ideal for use where lots of small text is required. 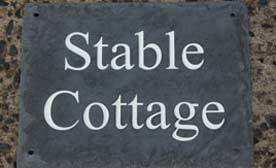 For lots more ideas have a look at the gallery of slate, granite and stone signs we have made for our customers.